I know it’s been quite awhile since I’ve posted on Coffee-Stained Pages, but I thought I’d put a quick post up to let you guys know about my new blog. I’ve created a new home for my blogging at www.dominiquekane.com, where I’ve been sharing my travels, photography, experiences of life in Sydney, covering events and even doing some fashion and book related posts. Recently, my post on lesser known travel memoir books (click: here to read) was featured on The Huffington Post, and I’m very grateful to have had several other articles published by them as well. While I don’t discuss books on my new blog as much as I once did (alas, life has changed since my university days, and I find myself reading less than I’d like), I would love to hear from you at www.dominiquekane.com and am keen to re-engage with the book blogging community. “Most fairy tales begin with an act of cruelty; gingerbread houses, someone abandons a child in the forest or whatever, but this one begins with an act of kindness — a man saving a swan.” Patrick Ness said of his latest novel The Crane Wife at the Sydney Writers’ Festival on the 25th of May. But try he did, racing out into his back garden half dressed, to find a magnificent crane with an arrow shot through its wing. He helps it — it flies off. As this seems a somewhat an unlikely occurrence in a small back garden located in the outer suburbs of London, everyone George tries to tell about the crane suspects he dreamt it. George goes back to his life managing a printing shop and amusing himself by making small, artistic cuttings out of old book covers. Until the striking, mysterious Kumiko enters his shop one day, and they begin a relationship. As an artist, Kumiko collaborates with George by fusing his book cover cuttings with her elaborate artworks made of fine white feathers. Together they begin to make quite a lot of money. Kumiko has an almost magical presence, even George’s daughter Amanda is somewhat mystified by her, though she is uncertain of the speed at which Kumiko and George’s relationship seems to be moving. Amanda has a hard time connecting with others, mostly due to a tendency to say the wrong thing at the worst moment, and what George describes as a “slash and burn” approach to trying to find herself as she moves through life. I found Amanda to be a fantastic character; frustrating, heart-jerking but very real. The story is interspersed with another tale of a crane and a volcano in love, and the destruction that their love brings. But George cannot bring himself to be satisfied with the story, to merely live with the extraordinary. The result is a tragic and moving, in this intricate novel that concerns itself with what it is to love, and how knowledge, power, possession and kindness interconnect with it. Le Sueur’s account of the several years he spent working at a highly dysfunctional hotel in Tibet will be enjoyed by readers interested in visiting the country and it has some pretty funny moments. It has been dubbed Faulty Towers in Tibet by many, but for me this was, in part, its problem. While Le Sueur comes to understand Tibet, he seems to get to know few Tibetans well. After all, he is working in a hotel populated by an ever-changing contingent of tourists and manned largely by foreigners. Le Sueur gives a great account of what it might be like to run a business while dealing with the whims of the Communist Party of China, in a politically-charged atmosphere. This is sometimes interesting, but can become tedious to read about with lots of red tape and random, arbitrary decisions. I find commenting on the short comings of non-fiction travel writing difficult, as it seems a pretty tall order to expect the author to bend the truth into some sort of narrative structure, when life is in fact often haphazard and meaningless by nature. But for me this book did feel like a lot of random occurrences strung together, and as a result I found myself fairly indifferent to whether I actually finished it or not. “It is altogether curious, your first contact with poverty. You have thought so much about poverty — it is the thing you have feared all your life, the thing you knew would happen to you sooner or later; and it is so utterly and prosaically different. You thought it would be quite simple; it is extraordinarily complicated. You thought it would be terrible; it is merely squalid and boring. It is the peculiar lowness of poverty that you discover first; the shifts that it put you to, the shifts that it puts you to, the complicated meanness, the crust wiping.” — p 13 Down and Out in Paris and London by George Orwell. This is my third Hardy novel, but I’m getting the feeling I should have stopped after my first. Both A Pair of Blue Eyes and Far from the Maddening Crowd are very different to the more nuanced, and at times dark, Tess of the D’Urbervilles. The former two read more like very typical Victorian-era, romantic fiction, where as the latter is much richer in both its content and gorgeous prose. That said, I enjoyed A Pair of Blue Eyes much more than Far From the Maddening Crowd. The heroine Elfride Swancourt (who was based on Hardy’s first wife Emma Gifford) is flawed, but immensely likeable. The male leads are slightly annoying though, especially Henry Knight and his rather possessive and condescending nature. Knight’s views on women certainly highlight the oppressive and sexually-prejudiced atmosphere women existed in during that time. His attitude comprises one of the main themes of the novel and provides plenty of material that will aggravate modern readers, but is interesting from a theoretical perspective. The bulk of the plot was pretty predictable and didn’t really grasp my attention that well. But this meant I was taken by complete surprise when Hardy chose to end the story in a way totally contrary to my expectations, which I loved. Ever since I read and loved Tess of the D’Urbevilles last January, I’ve been meaning to check out some of Thomas Hardy’s other work. 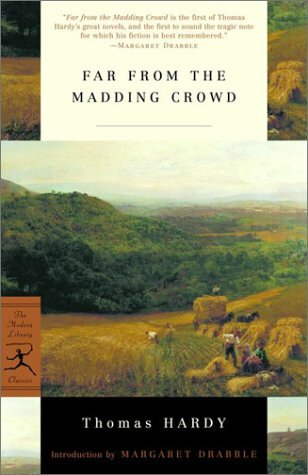 Unfortunately I found Far from the Madding Crowd nowhere near as enjoyable as Tess. The plot revolves around the beautiful and flighty Bathsheba Everdene, who must choose between three suitors: the lovely, constant and only likeable character in the entire book Gabriel Oak, the heart-breaker Sergeant Troy or the middle-aged farmer Boldwood. Hardy starts out lavishing the reader with the same gorgeous prose about country life that I loved in Tess, but as he gathers speed with the story this falls away. In terms of the books plot, I disagreed with all of the choices Bathsheba made and found her annoying rather than endearing, I didn’t like the way any of the action played out and the only character that I even remotely cared about was Gabriel Oak. I also found it to be a very slow moving novel. It seems reading Tess of the D’Urbevilles first may have been a mistake, it’s possible everything I read from now on will pale in comparison. Best. Concept. Ever. Stealing the blurb from the back cover, Zombies vs Unicorns is “a short story feud that pits horned beasts against the shuffling undead.” A great group of authors have contributed stories about unicorns and zombies to this anthology, with the aim of convincing the reader that either stories about zombies or unicorns are better. Editors Larbalestier (Team Zombie) and Black (Team Unicorn) punctuate the collection with commentary about the mythical origins and influences behind each story, while also arguing why their fantastical creature is far more entertaining to read about. The result: a hilarious, whimsical and poignant collection of short fiction. I absolutely could not stop laughing when I was reading this one. A practical unicorn defies convention and seeks out a non-virgin, modern girl to aid him in his quest to rescue baby unicorns at risk of being sacrificed. “Do you see hands at the ends of these?” the unicorn said. Alison cracked open an eye enough to see that yes, the unicorn was still there, and it was waving a silver hoof in her face. There wasn’t any dirt on the hoof, even though the unicorn was standing in the middle of a torn-up meadow. “What does being a virgin have to do with opposable thumbs?” she said. I loved this story about the daughter of a dictator in control of the island Curacao, a settlement closed to the outside world that shoots down refugees in order to remain safe from the zombie infection. Fifteen-year-old Iza struggles with her father’s power over both her and everyone around her, before discovering that she can be a powerful woman in her own right. Iza’s loneliness and isolation dominates the mood of Bougainvillea, giving the piece of short fiction a moving quality. In short, Zombies vs Unicorns is completely amazing . Thanks to it I now have a whole bunch of new-to-me authors to try out. And I’ve already ordered a copy to give to a friend for Christmas. In order to relive my November trip to South East Asia, I decided to bump The Beach by Alex Garland up my to-be-read list. It’s told from the first-person perspective of Richard, a gap year student in Thailand. When a half-crazed Scotsman named Daffy gives Rich a map to a hidden island, he and some fellow travellers decide to set out in search of it. Once they reach the secluded island and join its commune they declare it to be Eden, and do their best to forget about The World. But as tensions arise in the community and too many drugs start to distort Richard’s view of the Thai paradise, it begins to turn into a nightmare. What struck me most about The Beach was the social anxiety constantly underlying the action. From the very beginning Richard puts a strong focus on recounting the reactions of all the other characters to everything he says or does, he details his often petty reasons for disliking someone and retells every social misunderstanding. This added to the tense atmosphere of the book and put me on edge. As the drama on the island begins to escalate so too does Richard’s tendency towards social anxiety, until he becomes very paranoid. I also found Richard’s fascination with the Vietnam War interesting, he begins by just making occasional references to films set in the war, but as the novel progresses he actually starts referring to people as VCs (Viet Congs) and wandering around thinking in army speak. As you may have guessed by now, seeing the beach from inside Richard’s head isn’t always a comfortable experience. On top of all of his other quirks, he suffers from vivid and violent dreams, which later progress into full-blown hallucinations. His personality also undergoes a journey, he starts off being rather likeable, but eventually shows himself to be completely self-absorbed and unconcerned with the lives of others. In fact by the end of The Beach the only two characters that I thought had any redeeming qualities were Étienne and Jed. The tensions present in The Beach between group thinking and individuality, combined with its focus on the brutal side of human nature, make drawing comparisons between it and The Lord of the Flies by William Golding unavoidable. It’s an uncomfortable but thrilling experience for the reader, and while I admired it I wouldn’t say that I enjoyed it. In November I went on an amazing holiday in South-East Asia. I thought I’d share a few photos from the trip. At The Grand Palace, Bangkok. Inside The Grand Palace, Bangkok. Me in front of Angkor Wat, Cambodia, at sunrise. Monks wandering around inside Angkor Wat. My tour group at Angkor Wat. Me at another temple in Cambodia. The “Tomb Raider” temple in Cambodia. My fried tarantulas with a lemon pepper sauce in a restaurant in Cambodia. Me eating the fried tarantulas. Me at Halong Bay in Vietnam. The Chrysalids has been on my wish list ever since I read and adored The Day of the Triffids last October. It follows the adventures of David Strorm, a boy living in a dystopic, post-nuclear-apocalyptic society located in a region called Labrador. Labrador’s population leads a very agrarian, pre-industrial era lifestyle; with no technology, cars or electric lights. The society is an intensely Christian one, but the religion has been morphed into having an obsessive focus on eliminating any mutations in people, livestock and crops. Since an event called The Tribulation, presumably some sort of nuclear catastrophe, mutations are rife, and are seen as impure and the work of the devil. This is particularly the case when it comes to mutations in humans, as this is a deviation of the image of man and therefore of the image of God. Mutated crops and livestock undergo ritualistic destruction, and deviant people (those who have a mutation) are exiled to the fringes, which are lawless, almost uninhabitable areas that are still suffering the aftermath of the nuclear apocalypse. This dystopia is revealed through the eyes of David, first as a very small boy barely comprehending his environs and later as a young man. When David is a child he makes a friend named Sophie, whom he accidentally discovers has six toes. Not understanding why this matters, he is confused at her horror at this revelation, and the instinctual reaction of her parents on hearing the news to start packing the family’s bags for escape. This is when he begins to question the radical slogans about mutants that he has been indoctrinated with. Under the guidance of his uncle, he begins to look at his society critically, something that is not encouraged. This was a really important theme in the book for me, the value of children looking at things critically, rather than just accepting things as they are and doing as they are told. I loved watching David’s mind awaken as he questioned and thought logically about his surroundings, from the young age of 10 onwards. Despite his ability to see that all is not right with Labrador, David harbours considerable guilt and fear about his own deviation, his ability to “think speak” with his cousin and several other unknown children some distance away. This ability is both a gift and a burden for the children, who benefit from increased knowledge and powers of reasoning through “thinking together” about problems, but also dread detection. An aspect of the plot I loved was that wherever David goes he’s perceptive enough to realise when he’s being fed a sermon pushing a certain point of view, whether it’s in Labrador, the Fringes or when in contact with other settlements. He has a discerning mind in the face of pervasive zealotry. Despite the strong influences of its mid-50s context; from the advances in nuclear weapons to genetics to the growing fear of technology in that period, The Chrysalids has in no way dated, and is a fantastic read. I can see how some might have qualms about the ending, but due to some of the plot aspects I’ve mentioned at I think it was actually quite clever. I am not usually one for big books; I get bored, restless and a sore arm. For this reason I put off reading the almost 800-pages-long The Passage by Justin Cronin until the week before it was due back at the library. But this book was so addictive, so gripping and so wonderful that I finished it in under a week (being hit by a cold and having two sick days probably helped… but still). I’ve looked back over the posts by other bloggers linked at the bottom of the page and they all describe The Passage with the similar terms “page-turner” (Novel Insights), “addictive” (Savidge Reads and All the Books I Can Read), “faced-paced” and “enthralling” (Page Turners). And it really is. To describe the plot of The Passage in a way that both does it justice and avoids misconceptions is a difficult task. Basically there are two main sections: one set in the present day, followed by one decades into the future. In the present day we meet Wolgast, a government agent tasked with convincing death row inmates to participate in a scientific testing for a government program in exchange for a lesser sentence of lifelong incarceration. It becomes clear that the virus injected into the subjects, with the hopes of discovering a way to prolong human life, has in fact caused them to mutate into monsters, or vampires. The twelve subjects break out into the world and bring about the apocalypse. Just before the outbreak and ensuing bloodbath, a six-year-old girl named Amy is experimented on and survives the experience without changing into a vampire. The setting then shifts to the future, in an enclosed settlement of people attempting to shelter from the virals, who have killed or “taken up” most of North America’s population, and perhaps the world’s. It is with the characters in this small colony fighting for survival that the reader spends the majority of the book. I’ve tried not to reveal too much more than the inside flap of the book makes clear, but since it’s such an epic book even that description encompasses a lot. I felt it was important to at least briefly outline the future section because that’s where the reader spends the most time and I felt the tone shifted considerably between the two time frames, from very bleak and to something more like the tone of The Hunger Games by Suzanne Collins; a thrilling, but completely necessary, sometimes deadly and inescapable adventure. A lot has been made of The Passage being a book about vampires, but the vampires here are so animalistic and lacking in humanity, except for in brief moments. They can’t even speak verbally like a usual vampire can, but they are sensitive to light and drink blood. The descriptions of them gave me the impression that they hardly even look human. They’re also rarely referred to as vampires, except for in the present day section. As a result The Passage avoids a lot of the usual subject matter of vampire novels and so readers sick of vampires shouldn’t miss out on this great novel by staying away from it. Oh, and it’s the first installment in a trilogy, so expect to hear more about this wonderful series. In French Milk, Lucy Knisley recounts the six weeks that she and her mother rented an apartment in Paris to celebrate their 22nd and 50th birthdays. Its blend of comic book style drawings, travel photographs and personal thoughts gives the book a collage feel, and results in a feeling of intimacy with Knisley. Knisley shares what she’s reading, how she’s feeling; from her bad moods to her longing for her boyfriend, and what she’s eating. This book made me pretty hungry. Most things set in France seem to affect my appetite like that. I found that the main theme in French Milk, apart from travel, was the conflict that many people in their early twenties feel in as they make that strange transition from adolescence to adulthood, as well as the anxiety about soon having to make one’s own way that nearing the end of tertiary education produces. These are all feelings I’ve recently experienced, but have not really seen captured in a book before, so I really enjoyed and related to this aspect of Knisley’s thoughts. This was just the trick today when I needed something light to entertain me while sick in bed. It’s short, whimsical, but also very poignant. And it’s my first graphic novel, I’m really keen to try out some more now after enjoying this one so much. Take the structured societal rules and preoccupation with manners of Jane Austen, a sexed up version of the conflict-ridden romance between Elizabeth Bennett and Fitzwilliam Darcy in Pride and Prejudice, some dandy vampires and lusty werewolves who have integrated into society a la The Sookie Stackhouse Mysteries, a guest spot from Queen Victoria and add a few steampunk touches and you pretty much have Soulless by Gail Carriger. That’s right, one book combines all those awesome things. “Alexia Tarrabotti is labouring under a great many social tribulations. First, she has no soul. Second, she’s a spinster whose father is both Italian and dead. Third, she was rudely attacked by a vampire, breaking all standards of social etiquette. Where to go from there? From bad to worse apparently, for Alexia accidentally kills the vampire – and then the appalling Lord Maccon (loud, messy and gorgeous werewolf) is sent by Queen Victoria to investigate. Alexia was a wonderful character to travel through this story with; stubborn, assertive, argumentative and partial to copious amounts of tea, treats and Lord Maccon. I broke out in giggles a number of times while reading this book, which is always a good sign. The combination of Alexia’s personality, her less than loving family and the plot’s mystery reminded me a little of The Sweetness at the Bottom of the Pie, but only a little. 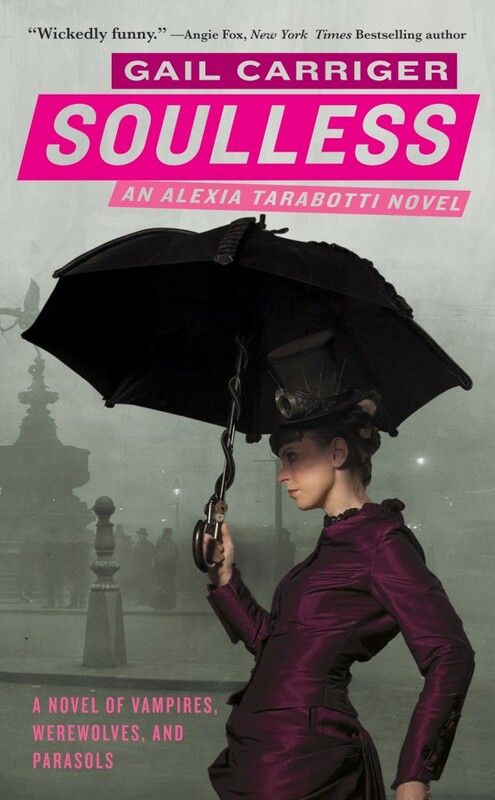 Soulless is gloriously fun for anyone who enjoys a light, slightly tongue-in-cheek read. I know I’ll be reading Changeless, the next installment in The Parasol Protectorate Series. “Mr MacDougal gave her a shocked glance. As subtly as possible, Alexia winked at him. He looked as though he might faint but sat back in his chair, clearly of a mind to let her deal with the situation in whatever way she saw fit. Miss Tarrabotti had the transitory idea that he might be suitable husband material after all. And then realized that a lifelong alliance with a man of such weak character would certainly turn her into a veritable tyrant.” – p 267. Gail Carriger’s Website and Blog. Cuba is on my list of travel destinations I’d like to make it to one day, and so when Enduring Cuba by Zoe Bran caught my eye one day I suggested it to my library as an acquisition (because I’m cheap like that). As someone who had only a limited knowledge about Cuba’s history before reading this book, I can honestly say it taught me a lot. Bran gives a very detailed account of historical events as they come up in her conversations with Cubans and fellow travellers. This can make the book a bit heavy going at times and for that reason I probably wouldn’t recommend it to someone looking for light, armchair travel, but it suited me. My only complaint is that I would have liked a few more accounts of Bran actually doing things in Cuba, as the majority of the book is made up of her conversations with people, which are interesting, but I did expect a bit more doing from a book under the Lonely Planet brand. That’s not to say there isn’t any action, Bran’s accounts of a cockfight and a religious festival involving animal sacrifice are vividly gruesome and capture the intense atmosphere. While these events were slightly uncomfortable to read about, they were a strong point of Enduring Cuba and I think it would have benefited from more captivating passages like them. 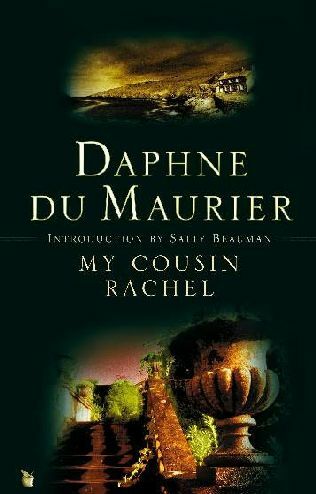 My Cousin Rachel is my third Daphne du Maurier, and the first I’ve read told from a masculine perspective. It’s told by Phillip Ashley, an orphan brought up by his older cousin Ambrose Ashley, as his heir. The narrator Phillip is older and looking back on events past knowing there is no altering them now. He opens his story by recounting a time that as a young boy he was goaded by Ambrose into throwing a rock at the hanging corpse of a man who was strung up for murdering his wife. As he recalls the episode, he ponders how to endure his life: “No one will ever guess the burden of blame a carry on my shoulders; nor will they know that every day, haunted still by doubt, I ask myself a question which I still cannot answer. Was Rachel innocent or guilty? Maybe I shall learn that too, in purgatory.” We learn of Phillip’s intense desire as a young boy to be just like Ambrose. We read his thoughts that “The boy who stood under her window on his birthday eve, the boy who stood within the doorway of her room the evening that she came, he has gone, just as the child has gone who threw a stone at a dead man on a giblet to give himself false courage. Tom Jenkyn, battered specimen of humanity, unrecognisable and unlamented, did you, all those years ago, stare at me in pity as I went running down the woods into the future? Had I looked back at you, over my shoulder, I should not have seen you swinging in your chains but my own shadow.” And so the first chapter concludes, and in just a few pages du Maurier has foreshadowed the events of the novel and set an intensely gothic and dramatic tone. Then the plot commences with Phillip as a young man in his twenties, who gets left behind at the estate as Ambrose leaves for Florence due to his poor health. Before long Phillip learns that Ambrose has married Phillip’s cousin Rachel, whom Phillip has never met, and he feels overcome with an intense jealousy and hatred. He imagines Rachel as a hundred different women, all completely detestable. Before long Phillip receives a worrying letter from Ambrose which indicates that he is unwell and expresses concerns about his doctors and suspicion of Rachel. Phillip leaves for Florence, but by the time he arrives Ambrose is dead and Rachel has left. He returns to Cornwall and eventually receives word that Rachel is coming and, believing her responsible for his cousin’s death, he intends to make her pay. But once she arrives he becomes completely obsessed and infatuated by her. But what are her motives? What happened in Florence? Is she Phillip’s evil seductress, or is she a victim? Is Phillip naive? Paranoid? A victim? Mentally ill? As Phillip indicates in the first chapter, the reader will never completely know the answer. All this takes place in the subtext of the novel, in the foreground the reader analyses whether Rachel is corruptive or pure. But who is really doing the poisoning? It seems the whole story is poisoned by Phillip’s point of view. And how much can the reader trust Phillip as a narrator anyway? He is, after all, no objective bystander. And so in a novel seemingly about a mysterious, dangerous woman and a naive boy, du Maurier explores the concept of male authority. I think I preferred the My Cousin Rachel from an analytical perspective to the reading experience, partially because Phillip was so damn annoying and his voice permeates the novel. It was such an interesting read though and so different to Rebecca and Jamaica Inn. I think it’s the most interesting examination of male authority I have ever read in a fictional novel. Enter your email address to subscribe to Coffee-Stained Pages and receive notifications of new posts by email.